So like my profile says, I’m Ripley Connor, daughter of an alien-human and a terminator. And this blog is an assignment that I do not want to do at all. But I’m hoping it’ll grow on me since it’s better than writing analysis papers about some artsy movie, right? I just have no idea what Sameena expects. I know, my media and communications teacher says to call her by her first name because I guess she wants to seem cool and laidback or something. She wants us to write not only about everyday stuff, but about our families, our backgrounds, who we are. I just want to pass this class. I know I have to play up the whole alien-terminator thing. She loves terminators and aliens. It’s like she thinks being human is just boring. I swear, if she asks me one more question about my great-great grandmother, I will die. 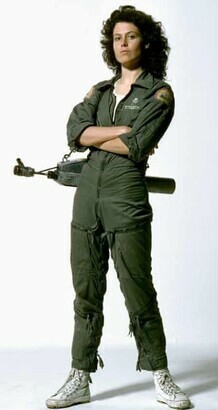 Ellen Ripley was a cranky old woman when I met her!! The only cool thing about all this is I get to read Dale’s blog. He already knows I like him, so I don’t care if he reads this. Hi Dale!! I really have to figure out what to talk to him about. Everyone says he’s a great football player. I mean he is super buff, definitely terminator. I went to one of the games and only stared at him the whole time. I want to talk about how great the game was and kinda know what I’m talking about, you know? I don’t even know what position he plays. I guess I have to finally learn football from Dad. So not looking forward to that, but Dad will love the whole dad-daughter bonding thing. It worked for my sisters, but actually, I really prefer church. At least I understand that and like it! I heard you can actually make money from some of these blogs. Maybe I’ll finally be able to buy some decent clothes. Mom and Dad said they can’t afford everything I like. I mean, I want to be a fashion designer and a model, so I need to wear the clothes I love. I can see what fits, what works, learn about good fabrics. Mom says just to try things on in the store. It’s not the same. I know Dale would be BLOWN AWAY by me in a gorgeous Armani outfit. I mean, everyone would just die! Dad says I should get a part-time job to pay for the outfits. I think I am going to. If I get a few modeling gigs, I can make a lot of money. I have to get some head shots and go to every modeling agency in town. I guess I should also learn how to draw if I want to be a fashion designer. And sew. I’ll have to buy a sewing machine, but then I have to learn how to use it! And I hate learning about new technologies! Too much new stuff! And we have to make a Facebook and Twitter page for this class. I really should ask Dale to help me with all this technology, right? Posted by Ripley Connor on April 14, 2012 in Blogging, boys, family, fashion, school, technology and tagged church, Ellen Ripley, football, modeling, Sameena.